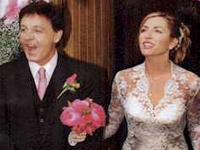 Paul McCartney and Heather Mills were married on June 11, 2002 at Saint Salvator’s, a 17th century church on the Castle Leslie estate in Glaslough, Ireland, 80 miles north of Dublin. Sir James Paul McCartney was born June 18, 1942 in Liverpool, Merseyside, England. Lady Heather Anne Mills was born January 12, 1968 in Aldershot, England. Heather and Paul met at a London charity event in May, 1999. Paul proposed on bended knee on July 23, 2001 at England’s Lake District at the Sharrow Bay County House Hotel. After formally announcing their engagement on July 26, 2001, Heather lost her $21,000 diamond and sapphire engagement ring. It was later found on a golf course. Following an engagement in Jaipur, India, the couple set about making plans for their wedding event which drew worldwide attention. Heather wore a fitted wedding gown in ecru lace that she designed with Eavis & Brown of London. She carried a bouquet of two peonies and eleven pink McCartney roses. Saint Salvator’s chapel was filled with flowers imported from Holland including carnations, Casablanca lilies, red, pink and yellow roses, white, pink and yellow tulips, hydrangeas, and cymbidium orchids. Heather walked down the aisle to the song Heather which Paul had written for her. They processed out of the church to a wedding march he wrote in 1966 for The Family Way. Paul’s brother Mike McCartney was the best man. The reception feast included Indian vegetarian dishes with vintage champagne, black Guinness stout, flowers from Holland, a lily-covered cabin cruiser, and fireworks. It also had double rainbows. After the ceremony and the reception, the couple boarded a vintage cabin cruiser and watched fireworks from the middle of a lake on the estate. Some of the 300 guests included Ringo Star, Adrian Mitchell, Sir George Martin, David Gilmour, Twiggy, Jools Holland, and Steve Buscemi, Aidan Quinn, Eric Clapton, Monica Seles, Sir Elton John, Chrissie Hynde, and Paul’s children. Their wedding reportedly cost $3.2 million. Heather and Paul honeymooned on Fregate Island in the Seychelles. The couple have one child, a daughter, Beatrice Milly McCartney born October 28, 2003. On May 17, 2006, Paul McCartney and Heather Mills announced their separation. Paul McCartney filed for divorce from Heather Mills on July 29, 2006. Heather Mills filed counter claims. On February 11, 2008, court proceedings began in the divorce case. Paul McCartney and Heather Mills were divorced March 11, 2008. Heather was awarded $48.6 million in the divorce settlement.